How strange that the right wing press has been lavishing praise on two men they previously vilified. The recent passing of Tony Benn and Bob Crow shows that death can change reputations overnight, turning sworn enemies into admirers. In the case of Tony Benn, the transformation was underway before the former cabinet minister died. It’s a long time since Benn had any real influence on British politics. He had already acquired the status of national treasure, and one of the greatest political diarists. Yet thirty years ago, he was portrayed as the most dangerous man in Britain by his enemies. Tony Benn was steeped in Labour politics. He met Gandhi, Lloyd George and Ramsay MacDonald at a very early age through his father, who was a minister in MacDonald’s Labour government. He witnessed the disastrous schism in the party when MacDonald formed a national government with the Tories. Benn senior lost his seat when he refused to follow MacDonald. It’s ironic that Benn junior shared the blame for Labour’s equally disastrous civil war in the 1980s. Harold Wilson famously commented that Benn immatured with age. Judging from Dominic Sambrook’s account of Wilson’s last government in 1974-76 (a strong contender along with Heath’s administration for the title of our worst postwar government) Benn must have been an infuriating cabinet colleague. Britain was sliding towards bankruptcy, yet Benn refused to accept any need for spending cuts. Benn was above all a romantic. Like many from patrician roots, he idolised the working class and also saw the unions as beyond criticism. He saw nothing wrong in the likes of the Militant Tendency, which tried to capture Labour in the 1980s. When Labour’s 1983 manifesto was rejected by the electorate (along with Benn, defeated in Bristol), he didn’t ask whether the policies were wrong. This was pure self indulgence – at the expense of the people who most depended on an electable Labour party. 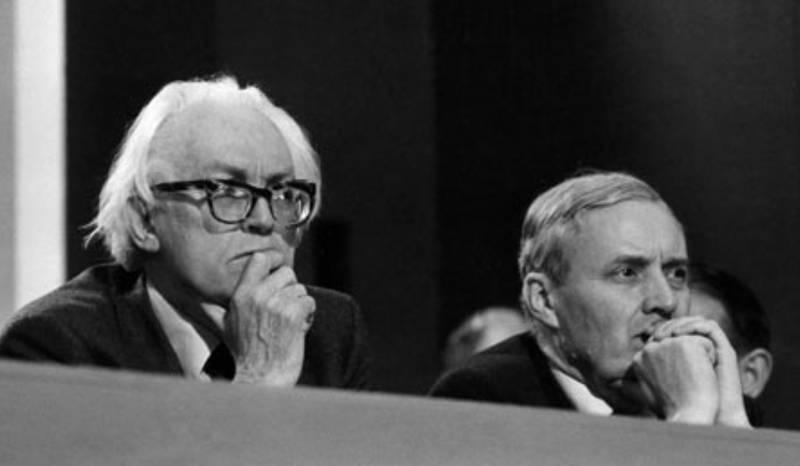 As a teenage Labour supporter, I felt thoroughly depressed by the left’s capture of the party at the 1980 conference (on the day my niece was born) and at the 1981 special conference at Wembley. Yet there was something noble about Benn’s love of parliament and rejection of royal prerogative. He fought for the right to renounce the hereditary peerage he inherited when his father died. He challenged British and American military adventurism. He questioned the assumption that we should join the EEC, years before the Tories discovered Euroscepticism. And he was a devoted family man – a politician with hinterland, as his rival Denis Healey would have put it. This entry was posted in Politics & current affairs by Rob Skinner. Bookmark the permalink.